I admit it .. I’m a storm junkie. Something about the drop in barometric pressure and the wildness in the skies. I became edgy. Can’t sit still or focus. Pace the perimeter. Waiting. Watching the sky. Watching satellite photos and charts. 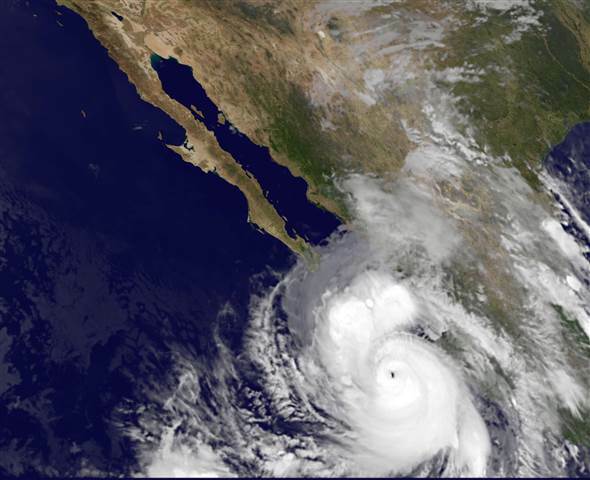 Norbert was to be small .. A category 1 storm for a short time and then a tropical depression. He fooled us all by building to a Category 3 – but all of it off the west coast of Baja – and with no serious impact. We had 3″ of rain in Loreto and an amazing 49mph gust. I was awakened at 3am by what sounded like a bucket of water thrown at the window. Palm fronds bent agains the weight of the wind. The normally placid Sea of Cortez whipped to a wind-chopped frenzy. A wild alertness that accompanies a storm. Yes, a junkie – particularly when they have some punch but no destruction. The storm sent clouds north from south and west of Cabo San Lucas on the afternoon of the 4th. By dawn (okay it was dark with no real sunrise) the storm had moved up the peninsula and after the 3am slam, rain and winds began to affect Loreto. By 3pm, the skies had opened, the wind had laid low the palm trees and ‘game on’ – the storm raged through and into the dark of night. Morning, the 6th, still dark skies, but by afternoon – clearing skies. Then sunset, an arm of the storm – now directly west of Loreto – laid a thick band of grey which intermittently spit water. Seas calm. Storm now a memory. We wait for the next circular disturbance.